It is every child's dream to go on Disney vacations and meet Mickey and Minnie Mouse. Whether you go to Disney World in Florida or Disneyland in California, they both would make for a fabulous family vacation. You can book fabulous Disney vacations package online to get some great vacation deals including flights, lodging, car rentals, and even park tickets. If you are heading south to enjoy your Disney vacations, you will be able to enjoy the themed parks of Epcot, the Magic Kingdom, Disney-MGM Studios, and Animal Kingdom. If the weather is a bit to hot, you can enjoy the water at Blizzard Beach and Typhoon Lagoon. On your Disney vacation you will find 16 different hotels available to meet your needs. You can take a walk on the wild side at Disney's Animal Kingdom Lodge or you can rock and roll all night at Disney's All-Star Music Resort. Maybe your looking for the tropical atmosphere of the South Pacific that can be found at Disney's Polynesian Resort or if it is Mardi Gras your after visit Disney's Port Orleans Resort-French Quarter. You could be heading west on Disney vacations to see all that Disneyland has to offer. The older of the two Disney parks that are in the United States, does not get all the glamour and prestige that its Floridian protégé does. Take a ride on the original Disney Railroad and enjoy the sites. The railroads stops at New Orleans Square, Mickey's Toontown, Tomorrow land, or Main Street, U.S.A. Stop in and see the adventure of the Pirates of the Caribbean or the Haunted Mansion. You will have many great family Disney vacations with lots of different sight seeing and lodging choice no matter which you visit. 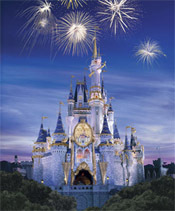 Disneyland and Disney World are going to please both the young and the young at heart.